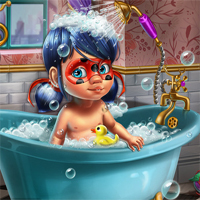 Take care of the cutest baby superhero in a new and fun game! Help the baby take a shower, give her toys to make her happy and when you're done bathing her, move on to the next step. Go ahead and change her diaper and then use the hair dryer so that she doesn't catch a cold. Have fun dressing the baby with the cutest tops and bottoms that you can match with shoes. Baby Ladybug will look adorable!